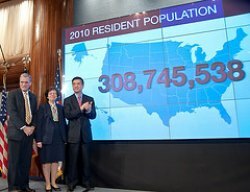 WASHINGTON, DC (HNN) - The U.S. Census Department has released WV 2010 Census Results by County School District. The tables include the total population of the county, total housing units (occupied, vacant). These statistics will be used in legislative reapportionment. Cabell County readers, the population has been listed as 96,319 with 46,169 housing units. Nearly 5,000 units are vacant. Kanawha County has a population of 193,063. They have 92,618 housing units of which over 4,600 are vacant.